Middle and Upper School students had been interested in forming a robotics team with the introduction of the IDEAS Lab makerspace at SRDS in 2015. After discussing how it might fit into the schedule and curriculum as well as receiving a generous donation from a family, a few students stepped up to lead the team. Mrs. Bluth, computer science and math teacher, took on the research and initial coaching duties. She attended several NJ First information sessions and coordinated students to attend and observe at a First competition in NYC in the Summer of 2018. Mrs. Bluth was able to get permission from Eileen Lambert, SRDS Head of School, and recruited a handful of Upper School students to get started. I want to learn how to code and program. I also want to learn how to physically build a robot. I've always wanted to learn how to do these things but never had anyone to teach me. I want to be able to learn the difference components of robotics. From having no experience, it seems very interesting to me that we are able to build a robot and compete. Upon further reflection and examination of all that teams try to do in FTC, the team agreed that this year the primary goal was:to figure out how to compete successfully in an FTC match, and to attend one competition. We ordered a REV kit in September 2018 and began meeting during school club times as well as after school Monday through Friday. Mrs. Bluth recruited Laura Hollis, Director of Technology and Verne Becker, Technology Integrator to help coach and coordinate the team. She also registered the team for several events during the FTC robotics season. Stephen Savas and Daniel Suh, both Upper School students, coordinated a meeting at which the name RoboRebels was selected for the team while Colin Costello, also an upper school student, took on designing a team logo. Not knowing how to build a robot, the team found plans for a basic REV robot and built that in time for the practice event at Dwight-Englewood in early October. About fifteen students from grades 7-12 attended this practice. The team worked on building their robot, meeting other teams, gathering information and even competing in their first ever scrimmage match against the Ironmen from Don Bosco. The team was very excited that we were able to move the robot fully over the barrier at the end of the scrimmage. After the event, the team shared a short video with the school, and for days other students talked excitedly about the team's success. During the practice, the team moved the expansion hub and battery so that there would be more room for some kind of grabbing device There were plans for some kind of claw, and scratches on paper, but no progress was made on that idea. Shortly before the first competition in November 2018 at Morris Knolls High School, a REV video showing the linear motion system was discovered. There was not enough time to add this feature to the robot for the competition, but a servo with a pole was added so that minerals could be pushed and then the pole could be moved out of the way to get over the barrier. 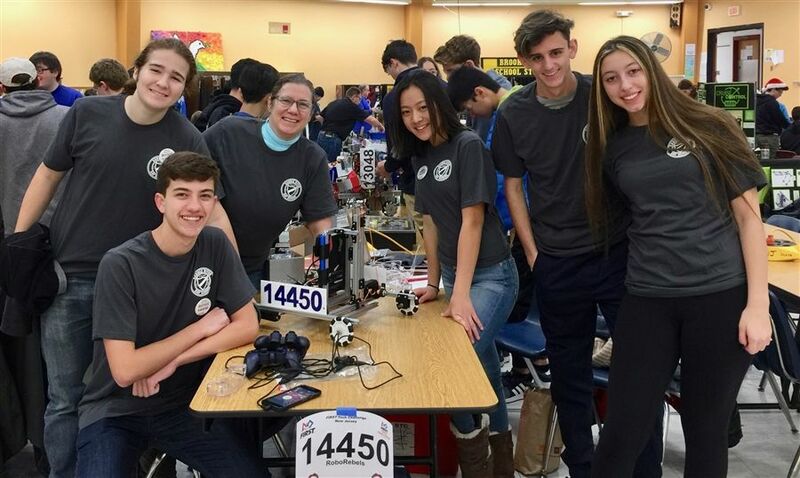 The six students and two coaches attended the competition at Morris Knolls High School in November as their first competitive event. We were excited to pass inspection for the first time. The servo did not work as intended initially, but Alex, the coder, adjusted the program and Stephen adjusted the bar so that by the end of the competition it worked as we had hoped. We were proud that we were able to contribute points to every match we participated in. We were usually able to get over the barrier. When we came back from that event we were prepared to add a linear motion system as our lifting device After 3 weeks of discussion and failures, we added the landing system. With only 4 days to go, we realized it wouldn't stay in place until the event started. Two days of scrambling resulted in two ropes in opposite directions on the same motor. This locked the robot in a hanging position until the autonomous phase began. The day before the next competition in December, our coder wrote code which would move the motor during autonomous and lower the robot. Six students, two coaches, and one mentor attended the next competition in December 2018 at Brooklawn Middle School. We were extremely excited when the robot landed in the third match, only to be stunned when it spun and collided into another robot! We fixed that problem by the end of the day and were so proud when we ranked 12th out of 30 teams for the day.